Can Pineapple Help Me Get Pregnant? There’s no doubt that a healthy diet can positively affect fertility, but can a certain food actually help you conceive? Popular anecdotes mention pineapple to be the wonder substance doing just that—here’s the truth behind the story. The short answer is that pineapple, while really good for you, isn’t really a miracle baby-maker. 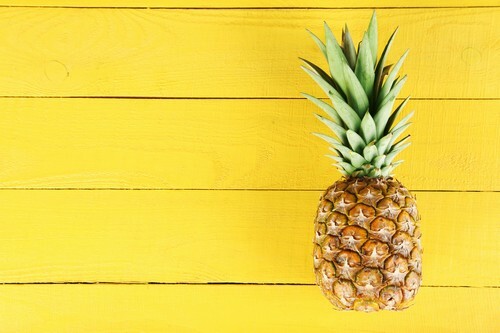 The pineapple-conception myth stems from the fact that the fruit is packed with an important anti-inflammatory bromelain, which promotes blood circulation. According to the theory circluating the web, this translates to assisting implantation of the embryo. However, experts explain the facts: BDA Spokesperson and Specialist Dietician Nicole Rothband says there’s no conclusive evidence that pineapples aid implantation. “Pineapple is rich in fibre and bromelain, but I found this to be linked to anti-inflammatory properties and benefits to blood and heart health,” she says. What’s more—bromelain is actually concentrated in the core of the pineapple anyway, not the flesh part that we typically eat. Interestingly, the opposite myth also proliferates threads on the internet; that pineapple should be avoided because it can induce premature labour or bleeding—this is also unfounded.